Note: EnvayaSMS is currently not actively developed. Its successor is Telerivet, a service that makes it easy for anyone to deploy their own SMS service anywhere in the world using an Android phone. Whereas EnvayaSMS requires significant technical expertise to integrate with an existing software system, Telerivet is a complete product that is easy for software developers as well as end-users. EnvayaSMS is a SMS and MMS gateway running entirely as an Android app. It forwards incoming SMS and MMS messages to a web server on the Internet, and sends outgoing messages from the web server to other phones. People with any type of mobile phone can send SMS and MMS to a phone running EnvayaSMS, without needing their own Android phone. It works wherever the phone can receive SMS messages and access the Internet (via Wi-Fi or mobile data connection). 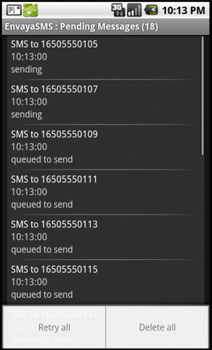 EnvayaSMS can be used to enable any web service to send and receive SMS and MMS messages nearly anywhere in the world. In particular, it is useful in countries where obtaining a local virtual phone number or SMS shortcode is difficult, expensive, or impossible. A phone running EnvayaSMS connects to the phone network in the same way as any other mobile phone, so it can be set up without needing approval from anyone else. EnvayaSMS is designed to to be maintainable even when deployed in remote locations that cannot easily be accessed by your organization's technical staff. With minimal training, non-technical users can do all setup and maintenance of deployed phones. EnvayaSMS is free to install on as many phones as you'd like. In order to deploy EnvayaSMS, you will need an Android phone with service on a mobile network. EnvayaSMS is compatible with many old or inexpensive Android phones.